Dominic is a wonderful character. The world knows Domino, his fierce stage persona, while he saves Dominic, the quieter and more intellectual side of himself for his private life. I really enjoyed Dominic’s personal journey in this story. Computer programmer Adrian is a very ordinary character and I love the contrast between his work in a cubicle at a bank with Dominic’s rock star life. I feel like the writing and editing is much stronger in this second book than it was in the first. This story doesn’t have any of the sensationalist over-the-top drama that often overshadowed Ray and Zavier’s relationship in the first book. I really loved this slightly more understated and thoughtful second story and I’m already looking forward to the next book in the series. This is the second book in the series, and I think it is far richer for having read book one. You need to understand the trauma that the band members have already suffered, and the price that the madness of their previous manager has taken on all of them. Dominic was a nervous and shy person from the beginning and the fear of being found out as Domino the rock star has been made even more worrisome since all the crazy that happened in the last book. I found the examination of a man leading two lives and trying to imagine which took priority, and which was really him, absolutely fascinating, absorbing, and demanding. It is done carefully and not overplayed but sits in the reader's mind as the story progresses and the need to be honest or walk away becomes imperative. He recognises that the developing relationship with Adrian is special. He is calmer, he is playing better, and it fulfils all his sexual fantasies, without danger or fear. But still, there is that last barrier he just can't surmount. He is at least honest with Adrian that there is a secret to be told, and Adrian is amazingly patient. I don't want to say more, as it will be richer for you to read it and get the reveal. I can say that it is a very well-crafted story, gives us more insight into the band and its future, as well as a very satisfying romantic, passionate, and intense new relationship. Fabulous, thank you Anna Zabo! For reviews & more info, check out our Syncopation post. 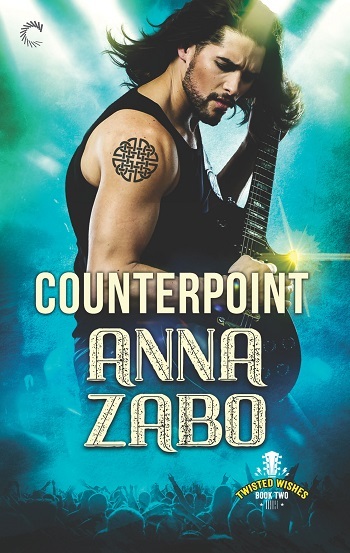 Reviewers on the Wicked Reads Review Team were provided a free copy of Counterpoint (Twisted Wishes #2) by Anna Zabo to read and review.